Bruins need to string together some goals without letting up anymore goals. I think the harder part for them will be not giving up anymore goals. Difference is breakdowns to breakaways. Lose track of guys, lose gms. Through 2, down 2. A little, late. Will take an epic 3rd period to pull this off. 3P goal dff this series: 5-2 BOS + 1 BOS empty-netter. Bruins still in it. But taking until halfway thru second to find your legs is no way to play. End of the second period, 3-1 #Habs. #Bruins get some momentum with Bergeron's goal late in the period. Montreal leading in shots 22-21. If hockey had a bullpen, the Bruins would have Seidenberg skating in it right now. Good set piece after faceoff win. Critical goal. Was looking like curtains. Now Bruins have hope. Patrice Bergeron gives the #Bruins life. 3-1 #Habs now with 2:12 to play in the second. Still more work to do, but it's not over yet. Heard someone say Hamilton was Bs MVP going into Game 3. Haaaahahahaha. No. Bergeron. Bergeron. Bergeron. Still a long way to climb,. Patrice Bergeron with high tip-down to get Bs on the board. Bruins can carry the play all they want; Montreal is protecting the house and has given up just 1 or 2 odd-mn rushes. Bs haven't penetrated. I once had a soccer coach who said "If our goalie has to touch the ball it's only because 10 men have made mistakes in front of him." Maybe they needed to get their butts kicked once in order to wake up their best players. Meszaros has won tonight's contest for best imitation, Statue of Liberty. Don't go with "your goalie has to stop breakaways" -- that's a massive team breakdown. Give Montreal credit. Cashing in. 26 minutes left in the game, but this one's feeling awfully over. 3-0 #Canadiens . You only get so many comebacks. Textbook counterattack by Canadiens. Hard to see Carey Price giving up four. #Habs dining on fast transition all-you-can-eat. Dale Weise scores on a the breakaway just after Meszaros' shot is blocked by Weaver. 3-0 #Habs with 6:08 to play in the second period. Carey Price getting some love from the crowd. Bruins have owned last 6 minutes. Critical to get rewarded before end of the second. Price on fire. Residual from pregame ceremony. Plekanec wins two puck battles in a row from Marchand in BOS D zone. Tick-tick-tick. Bs cannot come out of 50/50's at 50%. Or 0%. Well it could be worse. We could be Rangers fans, wondering if our team will ever score again. Marchand whips a shot towards Price, but the Montreal goaltender holds strong. Still 2-0 #Habs more than halfway through Game 3. Marchand an extra stick jab at Subban after the whistle. Don't need that. There's that anyway RT @MurphysLaw74 : Iginla and Soderberg back to life. Good news for Bruins! 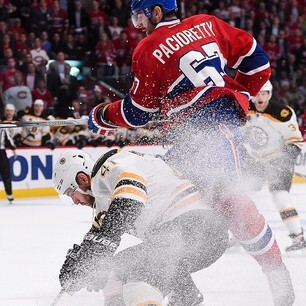 Soderberg can't get the shot away on a great pass by Paille. Would have been into an open net. Sweet passing combination but Soderberg can't jam it past Price. "Carey, Carey," in Montreal.